Johan Karlgren, also known as Pappas Pärlor, is a Swedish artist who creates interactive street art that makes his surroundings a lot more fun. Johan’s works are inspired by his passion – old video games, and that’s why all his characters that invade the streets are pixelated. 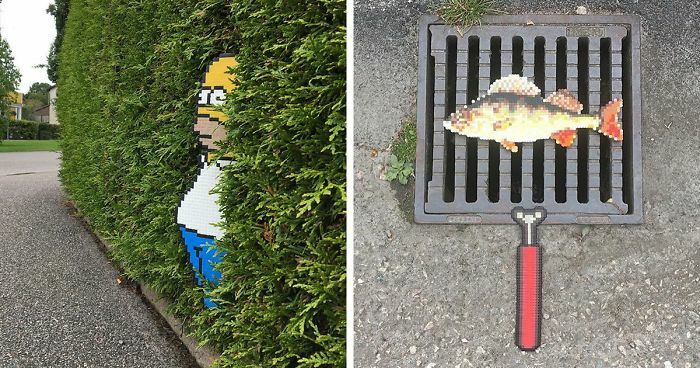 Pappas Pärlor’s pixel art can be usually found on our everyday objects, such as traffic signs, pipes, sculptures, fences and hundreds more. They are wisely incorporated into the functions of those objects which gives them new meanings while mixed with art. Scroll down to see them for yourself! 1985 me : "Why can't I shoot the dog!?!" If I stomp on the post will it run away? "You need vandalism? Why not Zoidberg?" This one is so cool!! It looks like someone ran him over. RIP Raphael. They're after my number one dime! where does this guy live with all these awesome looking mushrooms? eye of an artist for sure. awesome! I Love Pikachu! Please, everyone, give this pic a thumbs up! Its looks like an upside down shoe with a big cuban heal! wow! very cool! reminds me of that Destroy all Humans game. I told you not to park in my driveway! This one made my jaw drop.